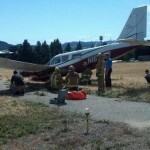 A twin-engine plane veered off the main runway at the San Luis Obispo County Regional Airport after its front landing gear collapsed on Wednesday, according to Cal Fire. Shortly after 3 p.m., the plane landed and as it was in rollout the landing gear at the nose of the aircraft collapsed. The plane then went off the end of the runway before stopping. No one was injured. However, the runway was shut down for about an hour as the plane was moved. @Moderator: I wish I could click on an article’s photo and see a bigger version. Any chance that might happen in the future? I’ve wanted that function as well – especially those robbery suspect ones… or any “have you seen this person” type thing.